Information and Records Management Strategy - helping you value and manage information as a vital business asset, ensuring you have the governance, processes and tools in place to effectively and efficiently look after both physical and digital documents and records throughout their lifecycle. Paper filing and archiving - designing processes for physical filing and archiving, reviewing file organisation and equipment, creating procedures and specifying service levels for offsite archive storage. We can facilitate archive holding consolidation and migration to new archive facility. 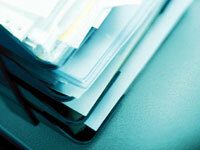 We can manage office moves and changes in terms of filing, furniture and IT equipment. We also provide barcode file tracking software for managing the location and movement of paper files and archive boxes. This system is specifically designed to provide barcode file management and tracking, which organisations deploy in-house to provide entire file lifecycle management, integrating as required with the storage inventory management system of offsite archive providers for seamless order processing. It includes hybrid physical and electronic records management capabilities, allowing you to manage and govern both formats on a consistent basis. It is ideal to track and trace important files, archive boxes, backup media, product and laboratory samples etc. Contact Reynold to arrange a demo. To get you going with an information audit we can help you create a bespoke spreadsheet template for data gathering. This data can then subsequently be imported into our IAR system if required. Contact [email protected] to discuss options and pricing. Bespoke Database Development - our IAR platform, integrated with an EDRM solution as appropriate, can provide the basis for developing a bespoke solution to automate information processes, such as DSAR or FOI requests, data flow mapping, security breaches etc. Information and Records Management Governance - authoring the policies, standards and procedures required to ensure that documents and data are stored, processed and retained in a manner compliant with business need, regulation and law (including meeting the requirements of NHS IG Toolkit standard 601). This includes international research into records retention and data protection requirements as required. Electronic Document and Records Management solutions - Specification, procurement and implementation of scanning, imaging, electronic document and records management, forms processing, OCR, full text retrieval, COLD / report archiving and workflow systems, including expertise and added value tools for SharePoint.